Thank You Duaw Davao Festivals Foundation for choosing my entry as one of the winners. Thank you for the P5000.00 cash. The contest was a laudable effort to promote the city’s foundation day this March, Duaw Davao Festivals Foundation is running a writing contest among local bloggers. The theme is based on the tagline launched by the City Tourism Operations Office last year — Davao: Life Is Here! Davao City will be celebrating her 75th Araw ng Dabaw festival in the middle of March 2012. The 75th Araw ng Dabaw BLOG COMPETITION is open to all Dabawenyo bloggers. Registration will commence on the kick-off event at SM City Davao, 11 February 2012, at 1:00pm. 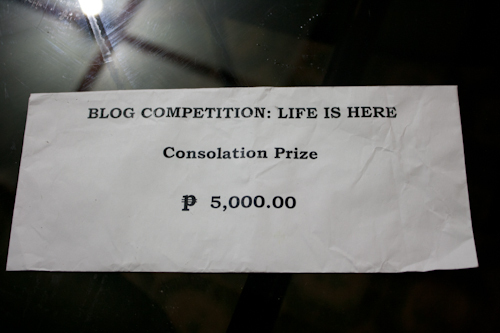 The blog can be written in English or Tagalog or Cebuano or a combination of the three. The competition will start on 11 February 2012 and will end at midnight of 29 February 2012. Winners will be announced on 13 March 2012 during the Mayor & Vice-Mayor’s Appreciation program. The blog entry must have a minimum of 400 words and a maximum of 1,000 words. Images can be added to accentuate the blog article. The blog entry, including accompanying images, must not in any way violate any intellectual property right. Anyone found to have violated this right in his/her blog entry will automatically be disqualified and will be required to delete the blog article. The blog must have a feedback/comment module. Part of the criteria for judging is the total number of unique feedback/comments received by the blog article. The decision of the board of judges is deemed final. All blog entries shall become the property of Duaw Davao Festivals Foundation,Inc. As such, the foundation has the right to copy, adapt, transmit, distribute, publish, and display the blog entries in part or as a whole. Blog entries must always be in published mode in the duration of the competition. The Duaw Davao Festivals Foundation and the City Government of Davao or any of the institutions/agencies involved in the implementation of the Blog Competition shall not be held liable for any copyright infringement committed by the participant. Any other negative results coming from the participant’s failure to follow the rules and regulations will not be the responsibility of the foundation. Duaw Davao Festivals Foundation employees are not eligible to participate in the competition. All inquiries should be addressed to Duaw Davao Festivals Foundation. Please call 286-4103 or email them here.